Documentary filmmaker, teacher, and infrequent Stand By For Mind Control contributor, Jacob Bricca (or as we know him here, Og), has a new documentary that’s out and about, playing festivals and whatnot, called Finding Tatanka, and it’s a movie you oughtta see. This is especially true if you live in the San Francisco Bay Area, where Finding Tatanka is playing on July 10 at the La Peña Cultural Center in Berkeley (ticket info etc. here). I’ve known Jacob since we were young’uns, so it is true I might lack a certain amount of perspective in recommending the movie he’s made about his father, but I’m not so blind I can’t see what a well-made film it is. Jacob’s father is the Tatanka of the title, a name he chose for himself during one of the many unusual periods of his life. 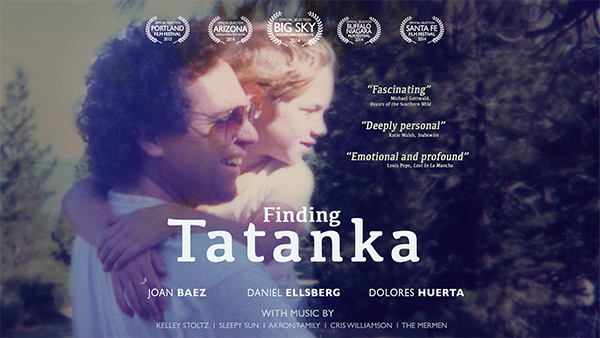 Tatanka was a social activist in the ’60s, and the movie includes interviews with his contemporaries, Joan Baez, Dolores Huerta, and Daniel Ellsberg. Tatanka found that doing what he felt he needed to do with his life precluded him from maintaining his marriage and raising his children, which ultimately led Jacob to make the film. It’s not that he ever lost his dad location-wise, it’s that to a certain degree, he never knew him. Interviews with Jacob’s mother and sister, other family, and Tatanka’s current wife, show the kind of wide-ranging effects Tatanka’s choices had on those who loved him. Though he initially devoted himself to activism, it didn’t last, and his life would go on to take many odd and unexpected turns. But so anyway, here’s what other folks of somewhat more repute than little old me have to say about Finding Tatanka.